Dark+Disturbing’s is always described as “a curatorial project by Vernon Ah Kee”. 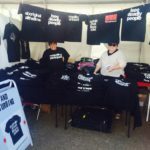 Until now, the only activity our audience has seen is the tshirts we have sold at a few Aboriginal art events and online. 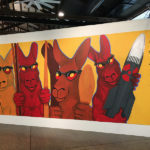 However, on Thursday last week, our second official D+D activity was launched – Gordon Hookey for proppaNOW at Cairns Indigenous Art Fair 2015.
Who knew my slow weekend in the lead up to Invasion Day would be so busy? Thanks to a bit of Tweet love (up to 195 RTs tonight!) from @BriggsGE, we’ve spent a couple of days fixing orders, counting stock, and researching pre-ordering website plug-ins. Dark+Disturbing is a project of Iscariot Media. The Iscariot Media team also work with the artist collective, proppaNOW. 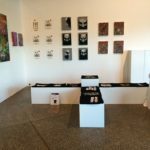 With proppaNOW we have created a range of tshirts by the artists as well as co-ordinating their inclusion in the 2014 Cairns Indigenous Art Fair. CIAF 2014 bump-in almost complete! Our mini-gallery at Cairns Indigenous Art Fair is almost ready. 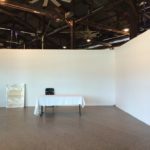 Tomorrow is opening day, with the Art Fair starting properly on Friday. Spending the week in FNQ! This is the start of the proppaNOW space for CIAF 2014. Doesn’t look like much right now does it? 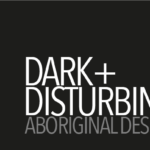 Dark and Disturbing are here today at Brisbane’s original “meeting place”, Musgrave Park, as part of Brisbane’s NAIDOC celebration. As you can see, our new website is live. We are still to add in the store. It’s far from cutting edge design. But it’s up and it’s functioning. And it’s the start of a much bigger adventure. 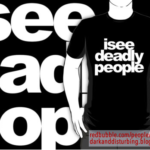 Our first Dark and Disturbing design has been uploaded to our Redbubble store. Redbubble uses digital on-demand printing. When your order a shirt, they act on our behalf. Any issues with printing or purchasing needs to be directed straight to them, though please let us know if there are any problems. After four years of talking about it, we’re almost ready to launch our first tees under the Dark and Disturbing brand. We have a new look and feel and are excited about what 2014 will bring. In the meantime, follow us on the usual channels, as we get ready to begin trading. Welcome to dark and disturbing. 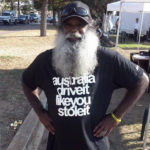 We aim to commission, produce and distribute t-shirts created by Aboriginal, Indigenous and First Nations artists. dark and disturbing is an emerging enterprise and we thank-you for your support. You can also keep in touch with us via Twitter, Facebook and Google+.